We’re all too familiar with the dangers posed by earthquakes, droughts, and hurricanes. But there’s another natural phenomena that represents a growing threat to our tech-driven society, and that’s space weather. And at long last, the US government seems to be taking the issue seriously. Apocalypse preppers have been stocking their EMP bunkers for years, but yesterday, the White House released the very first National Space Weather Strategy and Action Plan. These two documents outline goals and strategies for improved space weather modeling, forecasting, and response coordination. Ultimately, they represent a roadmap toward a future where the unfortunate arrival of a giant solar storm doesn’t spell the end of modern society. What’s Space Weather and Why Do We Care? Space weather is a fairly broad term encompassing a bunch of stuff the Sun hurls our way, including high-energy x-rays, magnetized plasma, and charged particles. All of these can interact with Earth’s magnetic field, causing geomagnetic disturbances that light up the northern and southern skies with dazzling auroras. Most of the time, these cosmic light shows are beautiful and harmless. Sometimes, however, things can get nasty, especially when the Sun releases a large burst of plasma known as a coronal mass ejection (CME). Large CMEs are unusual, and it’s even more unusual for our planet to line up directly in their path. But when that happens, CMEs cause geomagnetic storms that generate tremendous electric currents in the upper atmosphere. Some of this current makes its way into the ground, where it’s channeled by any and all conductive materials, including certain rocks, pipes, and electric cables. Currents from large geomagnetic storms can ultimately feed into our grids, melting transformers at the heart of power distribution centers. This [storm] started a chain of power system disturbance events that only 92 seconds later resulted in a complete collapse to the entire power grid in Quebec. The rapid manifestation of the storm and impacts to the Quebec power grid allowed no time to even assess what was happening to the power system, let alone provide any meaningful human intervention. Over the course of the next 24 hours, additional large disturbances propagated across the continent, the only difference being that they extended much further south and came, at times, arguably close to toppling power systems from the New England and Mid-Atlantic regions of the U.S. to the Midwest. Again, geomagnetic storms of this magnitude are rare, but it’d be unwise to assume we won’t see another in the years to come. In fact, a CME roughly four times larger than the one that caused the 1989 Quebec outages narrowly missed us in 2012. “If it had hit, we would still be picking up the pieces,” physicist Daniel Baker of the University of Colorado told NASA two years later. A report by the National Academies estimated that the cost of such an event could exceed 2 trillion dollars—the economic equivalent of 20 Hurricane Katrinas. 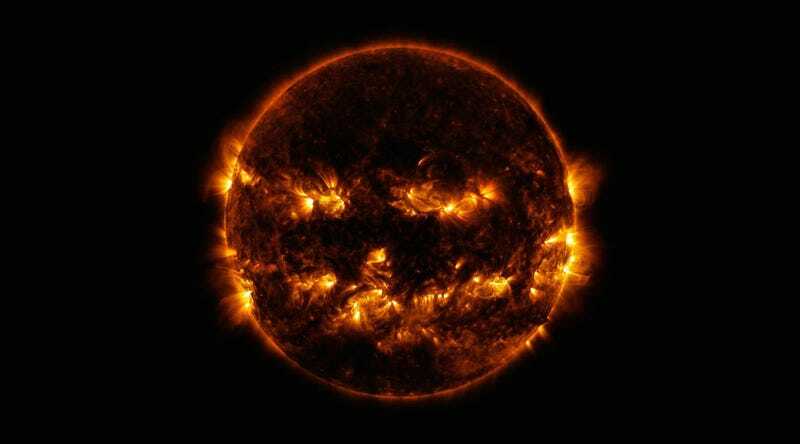 Clearly, it’s high time we to start thinking about how to prepare for the possibility of a monster solar storm. The National Space Weather Action Plan released yesterday describes how the US government will coordinate efforts on space weather forecasting, infrastructure preparation and education. Here are some highlights. Establishing the “Godzilla” Storm: On the science front, a key component of the White House’s new plan is figuring out just how big these suckers can get. To this day, the largest solar storm recorded on Earth was the 1859 Carrington Event, a series of powerful CMEs that ignited the northern lights as far south as Cuba, causing global telegraph outages. The Carrington Event has always been our benchmark for really big storms, but in recent years, observations of Sun-like stars beyond our solar system have shown that “superflares”—1,000 times larger than the Carrington Event—can and do occur. In 2012, a study published in Nature estimated that such a flare could strike the Earth every 800 to 5,000 years. That’s a pretty wide margin of uncertainty for such a potentially devastating event. Clearly, we need to get a better handle on the upper size limit of our own Sun’s eruptions and the actual risk superflares pose. Monitoring Vulnerability on the Ground: While we know that large pulses of electric current pose a danger to power grids, experts don’t agree on just how vulnerable our infrastructure is. The White House Action Plan calls for a nationwide assessment of vulnerability that includes factors like the age and design of grid infrastructure and the underlying geology. The DOE has also been tasked with developing a grid monitoring system that would “display the status of power generation, transmission, and distribution systems during geomagnetic storms.” Real-time monitoring tools like this could be used by grid operators who need to make fast decisions about when to shut things off. Improved Forecasting: A big aspect of our vulnerability to space weather is the fact that we have almost no lead-time before a large storm strikes. If a CME is heading straight for us, our first notice comes from the space weather monitoring satellites situated at the L1 Lagrange point a million miles in front of Earth. At best, these satellites give us about an hour’s notice. There’s a lot of room to improve our forecasting, and it starts with a better understanding of when and how large solar flares and CMEs occur. The White House Action Plan calls for more research on solar dynamics. Just as we can use weather models to predict the onset of tropical storms, with better solar models we might be able to forecast days, or even weeks in advance, when the Sun’s gearing up to punt a a giant blob of plasma our way. Cooperation: Perhaps the most dangerous aspect of a large geomagnetic storm is that its effects could be felt globally. This makes space weather unique among all natural disasters humans face, and it underscores the need for international coordination. To that end, the White House Action Plan outlines a number of goals and targets, including 1) an international meeting on the social and economic impacts of a large solar event, 2) multi-national acknowledgement of space weather as a global challenge, 3) facilitating open-access to space weather data across agencies and countries, 4) developing international standards for solar storm measurements and scales, and 5) developing a set of “mutual-aid arrangements” to facilitate response efforts worldwide. The last thing we want is for a bunch of power-hungry humans to panic. We’re all in this together, and it’d be nice if we didn’t devolve into a society of cannibalistic road warriors overnight. The new space weather action plan is just a roadmap, and we’ve got a long way to go before our IT-driven world can consider itself safe from the ravages of a monster solar storm. While I personally would have liked to see more focus on tangible ways we can improve our infrastructure—for instance, Kappenman has already developed low-cost capacitors that could be used to block current from flowing into a grid—I’m happy that our government is starting to pay attention to the threat. Perhaps one day, we’ll live in a world where we don’t all need Faraday cages, solar bunkers, DIY radios and farming knowledge to survive this cosmic disaster. But hey, if you’re into those things, more power to you (literally). You’ll probably outlast us all.